We live in a pretty amazing era. We’ve seen so many different technological advancements in the past decades. We have houses, cars and phones that can all speak to each other and interact. It makes our life easier. Processes are automated in factories that once took hundreds of people to perform. Technology can make us more productive and also safer. The era that we live in, while amazing, has also proved to be more and more litigious. In our most recent snow industry benchmark report, we found that slip and fall lawsuits are on the rise year over year. More and more snow contractors are being sued. And while some lawsuits might be frivolous and have seemingly no grounding, that doesn’t mean that they are automatically found not-liable. As mentioned, technology can do some pretty amazing things. For snow contractors, tech can be a life-saver. 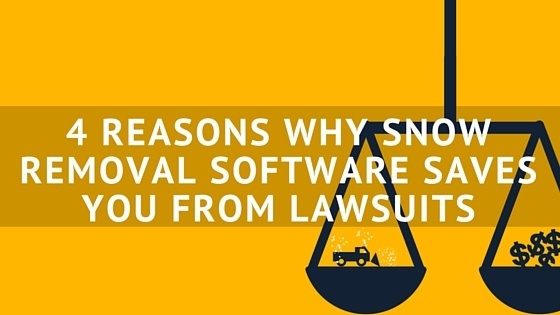 One way that you can shield yourself from lawsuits is by using a snow removal software. Here are four ways that snow removal software saves you from being sued for a slip and fall claim. The more documented information that you have, the better. Snow and ice removal businesses that work with commercial properties will have different stipulations within their contract stating when and how their property needs to be handled before, during and after snow events. Software that is able to give you the information before the snow starts to fly is going to let you know what is going to be happening and what is expected of you. If you’re plowing set to go out to a property immediately after the snow starts flying or the morning after, you’re able to access that information quickly. Snow removal software can protect you from slip and fall claims by allowing you to log all of your employee’s time on site. If you have a stipulation in your contract that you need to be onsite an hour into a snow event, you can provide time logs showing the times that your employees and even subcontractors were onsite. Together with a couple other valuable pieces of information, you can prove that you provided the work that you were contractually held to. Before and after pictures can be a helpful tool to have in your defense against lawsuits. If you and your employees are able take and store time stamped pictures of a customer’s property before and after work regularly, you’re doing yourself a huge favor if you are ever sued. Many property managers for commercial work are now requiring pictures for verification. Along with time logs, this can be enough to protect you from slip and fall claims. However, since we’re already on the topic, why not add one more layer of protection? A GPS system can prove that a particular asset was on your customer’s property at a given time, for a given duration. With most snow removal GPS systems, there will be a way to view a “breadcrumb” trail on a map. You’ll be able to see your trucks’ paths while plowing. Want to see what else snow removal software can do for your business? Just click the link below and see the powers of HindSite Software.